For a splash of Industrial Loft style inside or a sleek, comfortable seat outside, this versatile pair fits the bill. 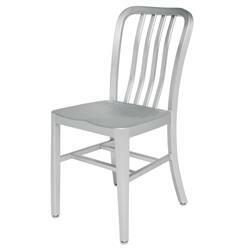 Lightweight but strong, these chairs are crafted from durable aluminum. Finished in brushed silver, this dashing duo is simple and stylish for a breakfast nook, wine table or shady spot on the porch.